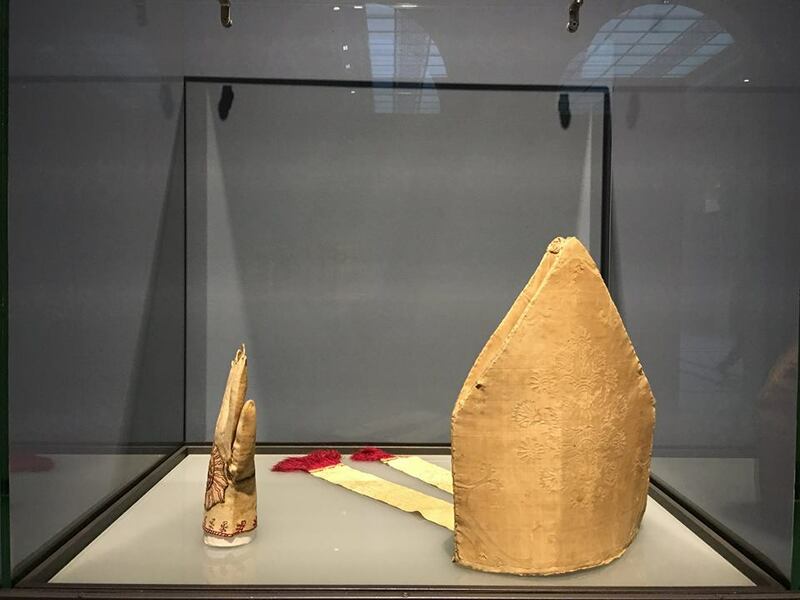 Our Ambrosian correspondent Nicola de’ Grandi provided these photos from a show currently going on at the Gallerie d’Italia in the Piazza della Scala of his native city of Milan. 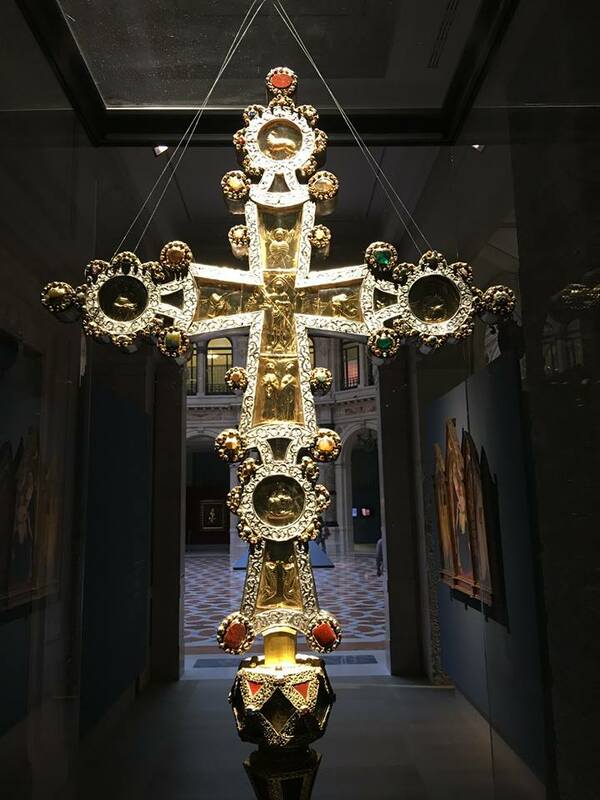 “La Bellezza Ritrovata - Beauty Rediscovered”, showcases over 140 artworks which have been recently restored in one way or another; art restoration is, not at all surprisingly, a field in which the Italians have a tremendous expertise and to which they devote enormous resources. 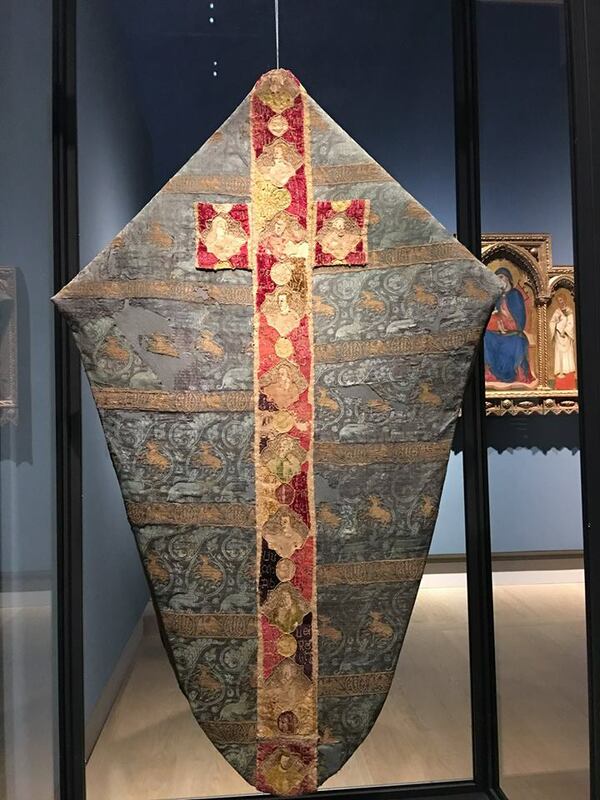 The works in this show come from every part of the country, and cover every kind of art, brought from churches, museums and archeological sites, broadly representing the whole of Italy’s incalculable artistic patrimony. 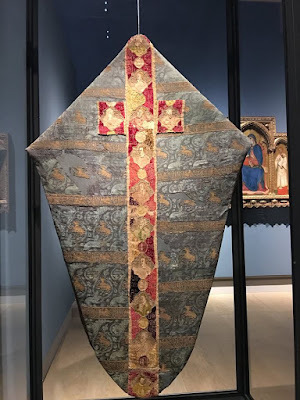 Paintings are well-represented in the show, but there are also the following very beautiful liturgical items. 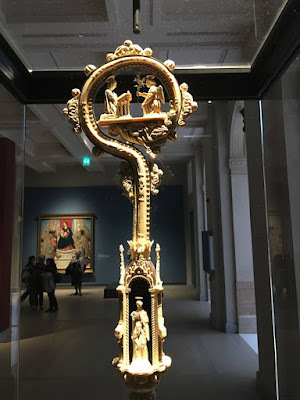 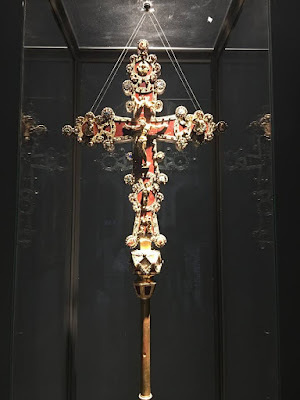 Processional Cross from the Abbey of Chiaravalle, the Cistercian Abbey of Milan, founded by St Bernard himself. 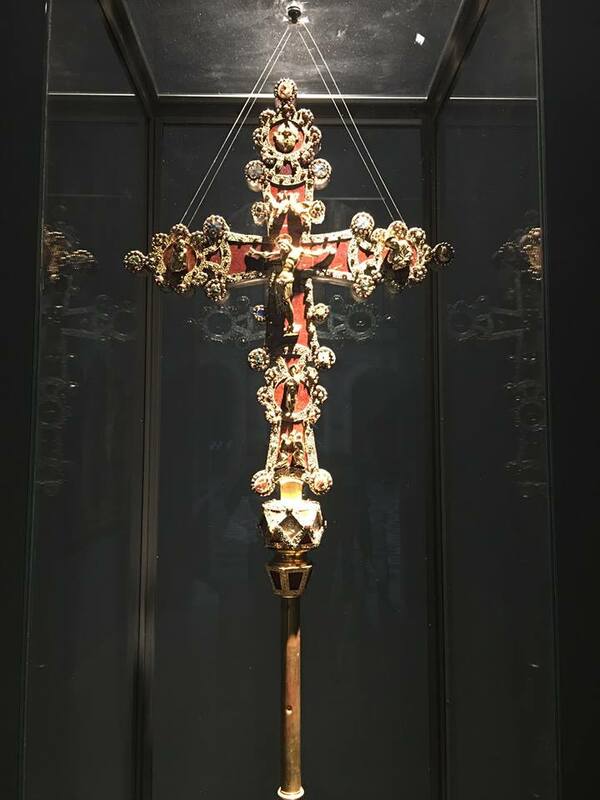 (“Chiaravalle” is the italianization of “Clairvaux - Bright Valley.”) Like the Cross of Desiderius, which we wrote about in December of 2014, it is made of two pieces from different periods put together; the first photo shows the side made in the 17th century, the second the side made in the 13th. 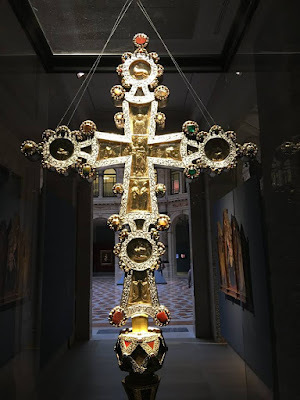 The older part was a gift to the abbey from Archbishop Giovanni Visconti, was also the founder of the Milanese Charterhouse at Garegnano; he died at the monastery of Chiaravalle in 1354. 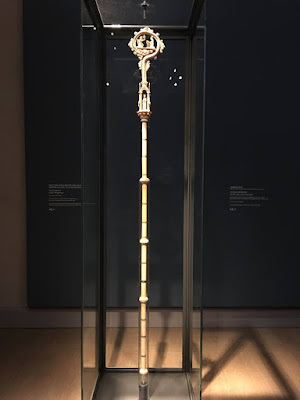 This ivory crook with silver inlay from the diocesan Museum of Fano in the Marches region is called the crook of St Pius V, to whom it was first given when he was made bishop in 1556. 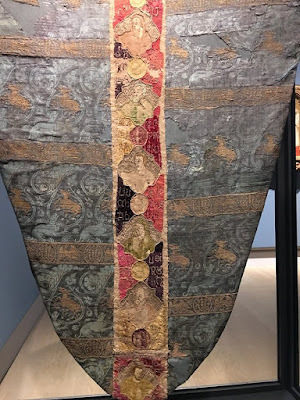 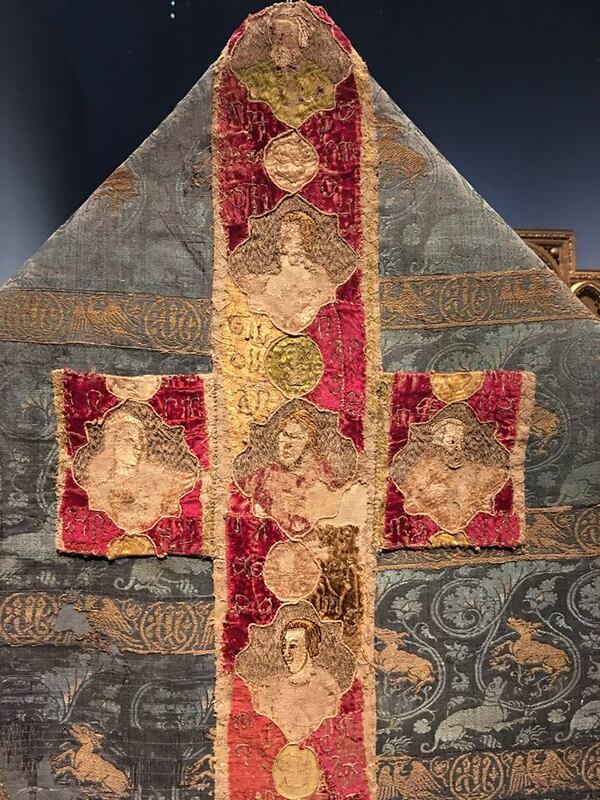 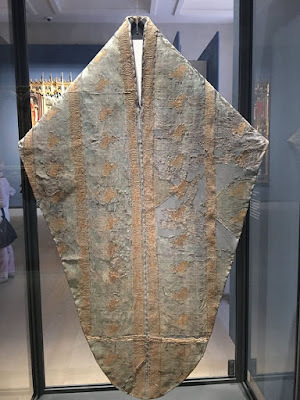 A blue silk chasuble of the 14th century, with a decorative cross in velvet added in the 15th. 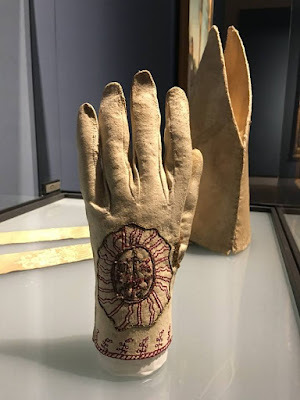 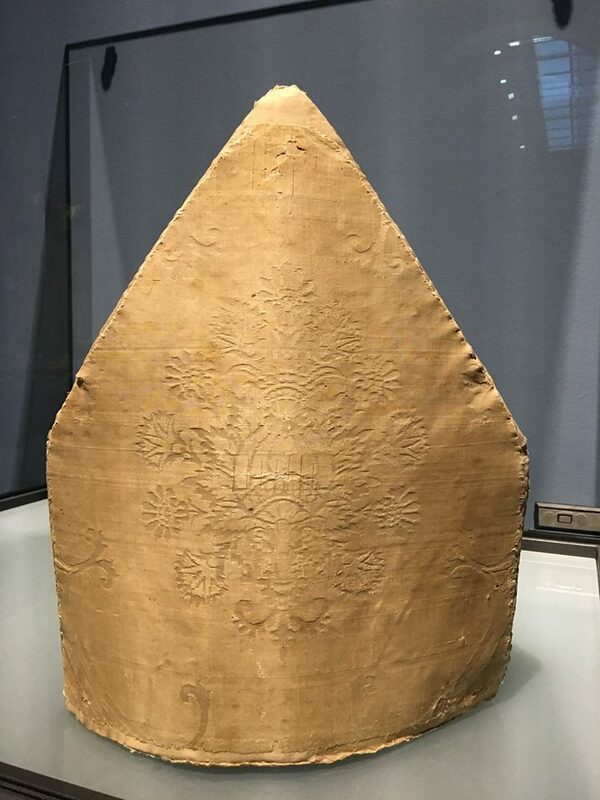 A miter from the end of the 15th century in white damask, and glove perhaps also of the 15th century, in white hide with metallic and red silk threads; from the cathedral of St Michael the Archangel at Sant’Angelo in Vado, also in the Marches.